Both before and after the repair of Atrial Septal Defects (ASDs), there is a tendency for atrial arrhythmias (fibrillation or flutter) to develop. These may be caused by the enlargement of the atria due to high pulmonary blood pressures, volume overload, and/or ventricular dysfunction. The older a patient is at the time of ASD closure, the more likely it is that arrhythmias will occur after the surgery is performed. This is due to the natural history of the atrial septal defect in and of itself. If atrial arrhythmia developed before the closure, then it has a considerable chance of recurring afterwards. 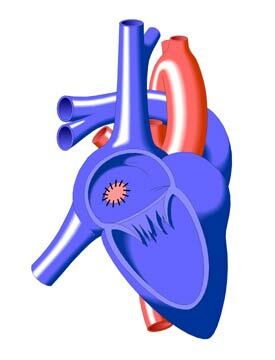 The best way to avoid the risks of post-operative arrhythmias is to close the hemodynamically significant (relating to blood pressures and saturation of oxygen and other gases) ASD as early in life as possible. Sometimes, a modified "surgical maze procedure" may be performed at the time of closure in which a series of incisions is made in the walls of both atria to discourage the tendency toward arrhythmia. Blood thinners may be prescribed in cases where a stroke caused by atrial arrhythmias is considered a threat.